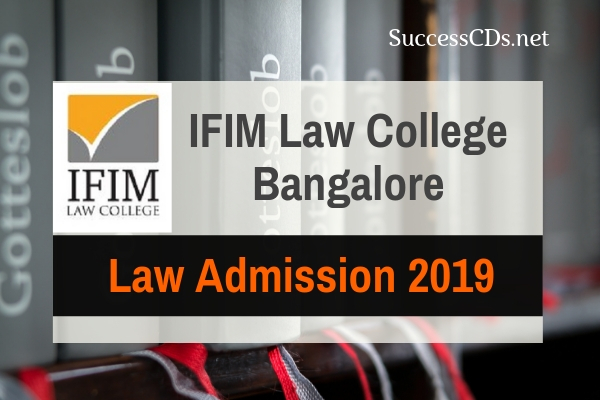 IFIM Law College Admission 2019 - IFIM Law College is affiliated to the Karnataka State Law University (KSLU) Applications are invited from eligible candidates for admission to 5-year integrated B.B.A. LL.B. Programs at IFIM Law College for the academic year 2019-20. In this notification, we are providing all important details regarding IFIM Law College BBA LLB admission 2019 including the application process, important dates, eligibility criteria etc. Applicant should have passed +2 / PUC or equivalent with a minimum of 45% marks. 5% relaxation is given to SC / ST candidates. The study criteria should belong to 10 / SSLC, +2 / PUC pattern. The applicant who has passed the prescribed minimum qualification in single sitting examination without having basic qualification is not eligible for admission for 5 years BBA. LLB course. Be or be less than twenty years in case of general category of applicants and less than twenty- two years in the case of applicants from SC, ST and other backward communities as on 1st June. Must have qualified in any one of the entrance examinations, viz., CLAT, LSAT, AILET or ILAT (IFIM's Law Admission Test). CLAT or LSAT or IFIM Law Admission Test, Personal Interview. Along with the completed application form you are required to pay a non-refundable application fee of Rs.1000/- through Online/Demand Draft from any Bank in favour of "Centre for Development Education" payable at Bangalore.